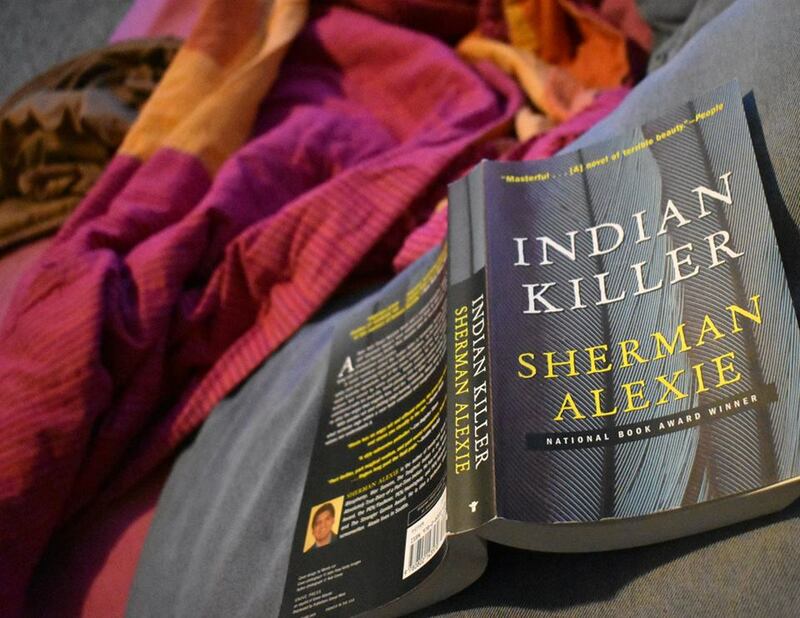 This book - Indian Killer by Sherman Alexie* - is February's pick for our online Lit Happens Book Club. Nina selected it and I was happy to oblige since it's not my usual genre. 'Gritty thriller' was one description. Okay, I'm game. Let me say that I was finished reading the book within 36 hours of it arriving in my house. I even woke up at 4 o'clock in the morning to read it because I was equal parts captivated and creeped out. But, in the end, I was less captivated, more creeped out, and sorely disappointed. The skinny: A serial killer is on the loose in Seattle, targeting white people. The assumption is that it's a Native American (Isn't that the correct term these days?!? Not 'Indian.') doing the killing because the victims are scalped and worse. After being scalped, one has his eyeballs eaten, another has his heart torn out. Are you cringing? I was. Characters that you actually like either are tortured, killed, or threatened. But not a single character felt like more than a caricature. There were victims and there were victimizers. Neither the characters nor the plot were fully formed. The only things fully developed were fear, hatred, and anger, often as a result of violence and abuse. It definitely wasn't my cup of tea. And I do have to complain about the title because it bothers me. Why is it 'Indian Killer'? Shouldn't it have been 'Killer Indian'?! It reminded me of the orca, the so-called killer whale. It's not a killer whale. It's a porpoise who kills whales. Whale killer, not killer whale. Same thing here. The killer doesn't kill Indians (Native Americans! ); he is one. I already wrote that I didn't really think any of the characters were totally fleshed out. But one character stands out as more likable than the others, at least to me: Sandwich Marie. Marie Polatkin, an undergraduate student at the University of Washington, is an idealistic activist who constantly challenges her white professor of Native American literature, organizes protests, and makes sandwiches for homeless people. "For the mentally disturbed, Marie knew these sandwich visits might be the only dependable moments in their lives. She also knew she delivered the sandwiches for her own sanity. Something would crumble inside of her if she ever walked by a homeless person and pretended not to notice. Or simply didn't care. In a way, she believed that homeless people were treated as Indians had always been treated. Badly. The homeless were like an Indian tribe, nomadic and powerless, just filled with more than any tribe's share of crazy people and cripples. So, a homeless Indian belonged to two tribes, and was the lowest form of life in the city." While there were plenty of food mentions and more than a few scenes in a donut shop with John, Paul, Paul Too, and John's parents, I opted to make a homemade mayonnaise for this post because mayo is noticeably absent from Sandwich Marie's offerings. She doesn't use mayo, she explains, because it's expensive and it would spoil before she could deliver all of her sandwiches. Makes sense. But, for our sandwiches, we like mayo. Homemade mayo, anyway. And it's super easy to make. Separate the egg, reserving the white for something else. Put egg yolk, mustard, and lemon juice in the bowl of a food processor. Turn the food processor on low and add the oil in a thin stream through the access chute. Once an emulsion forms, add the oil a little bit faster until it's all incorporated. Season to taste with salt and pepper. This stores in the fridge for up to a week. I used this batch of homemade mayonnaise in a remoulade for my Abalone Po'Boy sandwiches. That recipe will come later. But here's what it looked like! Here's what everyone else read in February 2019: here. Sherman Alexie has also credibly been accused of a number of not-at-all nice harassment actions and betrayals of people that trusted him (men and women). Very sad. HIs first works were better than this. I didn't know that. That's terrible. Not sure I'll seek out any more of his books. I wish I hadn't read this review before I read the book. Now I am not at all anxious to pick it up and delve in. Sorry! But different strokes for different folks and all that. You and I share reading tastes most of the time...but not always! Doesn't sound like a book I'd pick up, but the mayo looks delicious!